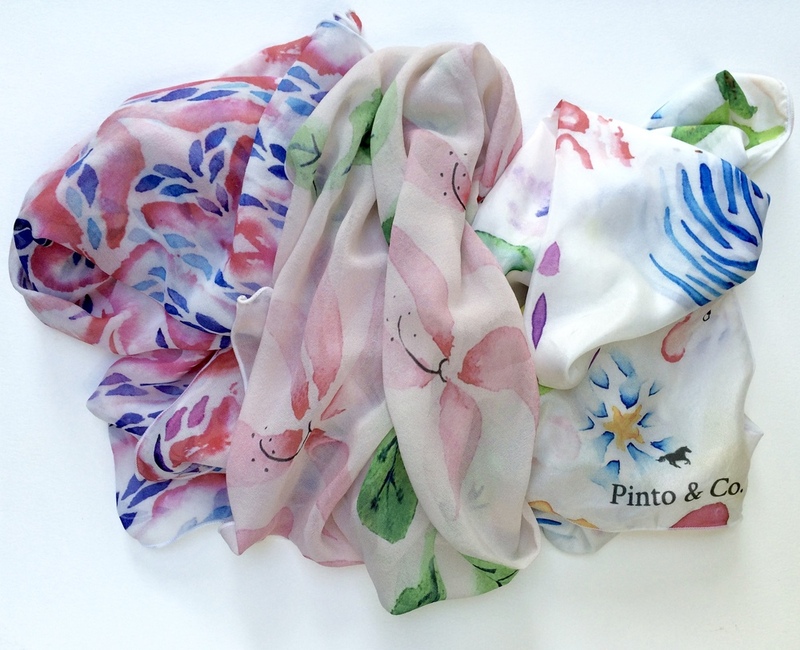 Blog — Pinto & Co.
Inspiration for the Calvin scarf. This one is named for my grandfather, Calvin Anderson, and inspired by his push for me to chase my passion and live authentically. A lifelong competitor, his memory inspires me to work hard, play hard, and leave plenty space for silliness. 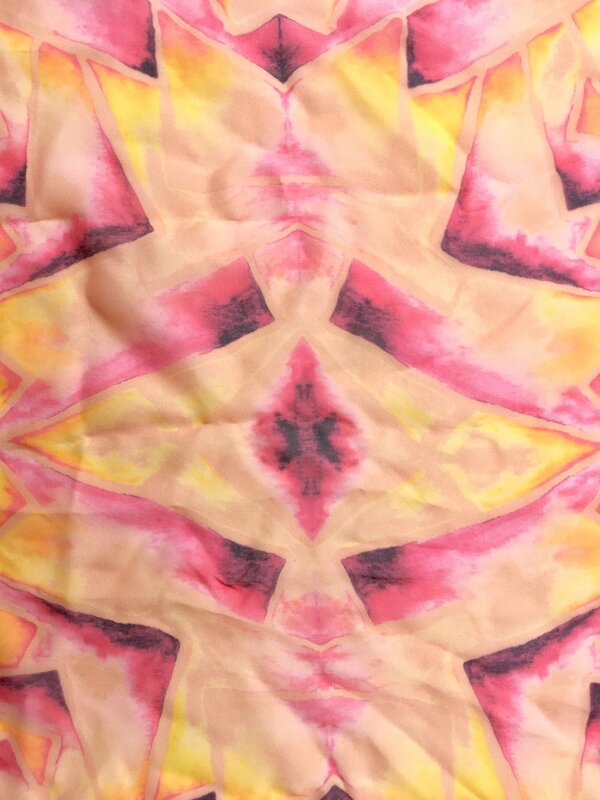 The Xiomara scarf is inspired by searing sunlight and jagged edges. Check out the journey from nature to neck wear. The Marianne scarf captures a range of blue from deep navy and to brilliant cobalt. See how clouds and petals in nature's most optimistic shade influenced this happy print. Inspiration and design process for the Noor scarf. Starting from photos, see how nature's green influenced the original drawing and the transformation to pattern and print. For me, clothes are fundamental. In their journey from two dimensions, to three, to positively vibrating with life, clothes become part of us as we place ourselves inside of them. The story of the pieces and the people who make them makes the brand. Pinto & Co. is one of the only places that makes purity of aesthetic and creation part of the bargain. I want my job to make a difference in the world around me while feeding my appetite for brilliant design, unforgettable user experiences, and impactful storytelling. If we're all quite honest with ourselves, most of us feel lost at some point in our lives. Each day, we're all trying to make sense of our surroundings as well as our internal thoughts, feelings, and impulses. We strive for orientation in a world full of noise, confusion and doubt. Art helps. Stories help. Good design helps. A great experience — in a book, an app, a theatre, a museum, a park— can be sense-making. It teaches us something and illuminates. That epiphany moment, whether it happens all at once or gradually over time, is what art is supposed to do. It should make us feel known. It should make us feel real. Art has done that for me, and it's inspired me to share my art with others. I hope that Pinto & Co. does that for you, too. I’ve always had an irrepressible desire to meld my love of art, nature and fashion. I was the kid in 3 different art classes who also made her own clothes, bags and jewelry. My company Pinto & Co. began when family and friends insisted on paying me for my work, and encouraged me (gently yet firmly) to make it official. 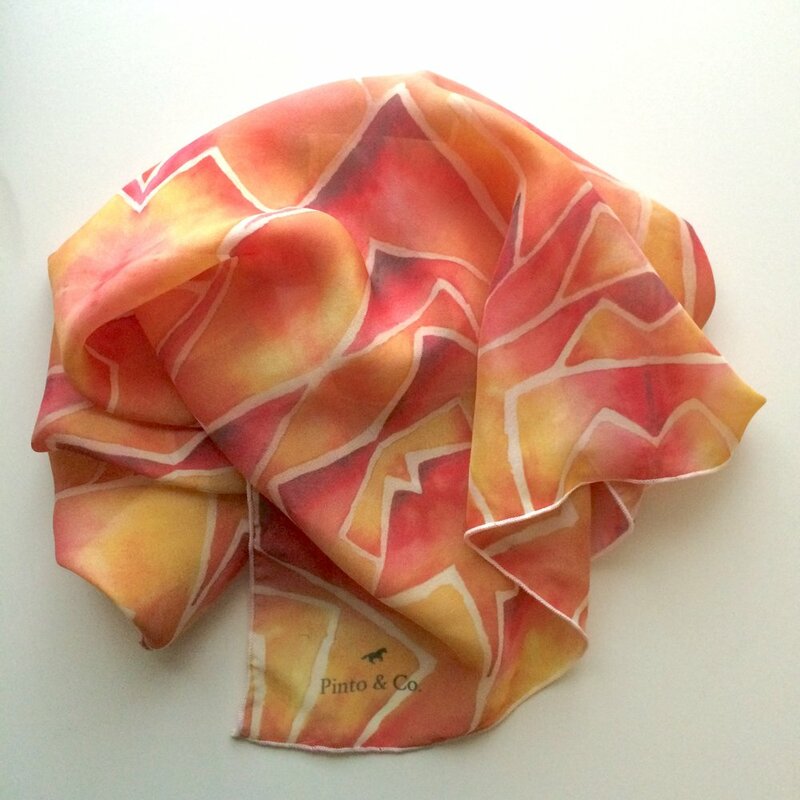 Now, I transform paintings and drawings of organic forms (like flowers and gemstones) into unique, luxurious silk scarves. My vision for Pinto & Co. is to give people tangible connections to nature and art in their daily lives. The transformation of perception, to painting, to pattern, to textile is incredibly powerful. I’m still totally stoked every time I think about fashion as the journey of a piece from one dimension to three — and then on through time as a unique human experience. I hope Pinto & Co. designs spark inspiration and joy in every person they touch. They say what you do in your spare time should be your job. For me, that’s online shopping and visual design. I'm constantly poring over design blogs like Dribbble, Colossal, Escape Kit, The Inspiration Grid and Design*Sponge to name a few. I'm also probably scouring the latest from my favorite basics designers: J.Crew, H&M, Madewell, Gap, Banana Republic, Ann Taylor. As a fashion lover with limited closet space, I'm drawn toward sturdy classics that I can make my own. As a native Californian, I need to figure out how to layer — preferably with something light, pretty, and multifunctional. 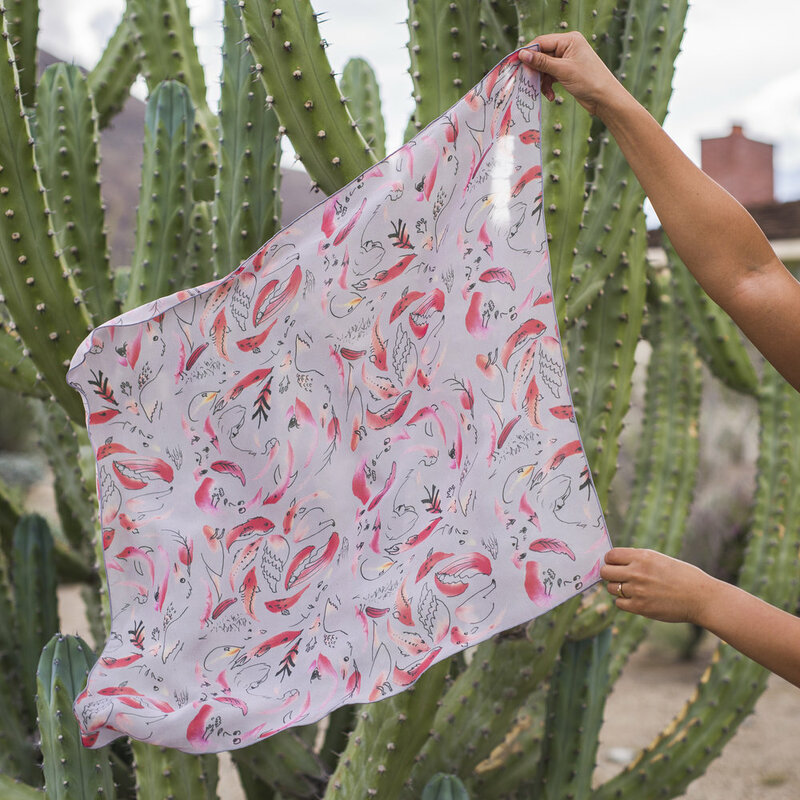 Silk scarves with original designs let people like me to both. I hope you'll try out a couple and see which you like best. I have three that I work well with my usual uniform of black, gray, white and navy. The Laura is one of my favorites. As an artist, I'm always looking for ways to bring more beautiful experiences to my day. As a consummate Bay Area kid, I'm also a big fan of pretty layers. These scarves solve both problems. The Laura and the Eva from Spring 2016, and an early, unreleased draft. When I started designing these, I wasn't sure how they would look. A friend of mine who works in textiles recommended I use art with less white space, but I like the airy look of the patterns I've been working on. Each design has a story and inspiration. I'll be sharing those in the weeks to come. Journaling has recently (in the past 5 years) become a very important exercise for me. It's a great way to converse with yourself and connect thoughts and feelings to the events of the day. I decided to put my paintings on journals to make this exercise more fun, more inviting, and more expressive. Plus, they make great gifts! Here's what they looked like when I first received them from Zazzle. To get yours, check them out on the Zazzle shop.